There’s a prominent strand of late-20th century cinema in Europe that I would characterise in terms of its relation to concepts of ennui and boredom, whether that’s at the level of subject matter (Michelangelo Antonioni’s L’avventura springs to mind) or formal methods. Jean-Marie Straub and Danièle Huillet, like their French compatriot Jacques Rivette to a certain extent, seem to fall into this latter camp, toying (if “toying” is indeed the most apposite word) with the aesthetics of duration — long takes and extended pauses — which can easily lead to accusations of boredom on the part of audiences and critics. I don’t mean, therefore, to come across as smugly superior when I say that there’s plenty of this cinematic tradition that I really enjoy — there’s no real reason why you should expect to like it, and I get the sense that these films and the filmmakers that make them don’t really seek anyone’s approval — but for those in the mood for something that unfolds at an almost catatonically unhurried pace, then Straub-Huillet are for you, and Sicilia! ranks among their more accessible works. Not the least of the factors at play in this assessment is the film’s relatively short running time of just over an hour, though that’s not to say it’s exactly fast-moving. There are in fact only a handful of different scenes in the film, taking place in different (sometimes picturesque) locations, making it all feel a bit like a travelogue — and while it’s not in any sense a documentary, it does have traits in common with that style. At the heart of the film is a series of dialogues motivated by the travels of the central character (played by non-professional Gianni Buscarino), who says he has returned from New York after 15 years to visit his hometown in Sicily. We see him first, back to the camera, sitting on the docks where he has arrived, talking to a poor man selling oranges, in the course of which is discussed the different diet in Sicily. He is then seen talking to strangers on a train, at home with his mother discussing his childhood and her relationship with his absent father, and then finally on the steps of a church in his hometown conversing with a knife-grinder. The dialogues touch, I suppose, on what it is to be Sicilian and to live on the island, though more broadly it is about being an outsider to one’s own culture and sense of identity. More immediately obvious, the film is ravishingly shot in highly-contrasted black-and-white by veteran cinematographer William Lubtchansky. 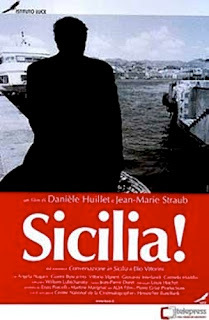 Any given image could be taken from the film and framed, particularly the still lifes that punctuate the conversations, or the long takes of the countryside (in silence from a train window, or panning across the protagonist’s Sicilian hometown and back again from a hilltop vantage point), which act as a sort of extended visual chapter break at various points throughout the film. Shots of the rugged faces of these non-professional actors are held at length after they’ve finished talking, as Straub and Huillet hold out for some kind of feeling of closure to the dialogues. That and the pauses in the actors’ speeches form the most consistent aspect of the directors’ stylisation, which suggests a further level of dislocation in the central character’s journey, giving the film a kind of dream-like quality. It is certainly difficult to describe just what makes the film enjoyable and fascinating, and it would be far easier to lay into it for being bloody-mindedly difficult and painfully slow, were I of that opinion. Instead I think the camera holds its subjects in a fascinated gaze that is as revelatory (after a fashion) as it is beautiful. I like the sense of awkwardness and otherworldliness that the acting style imparts, and the unrushed unfolding of the drama. It won’t be to everyone’s tastes I concede, but it’s an hour-long insight into a quite different way of making films.